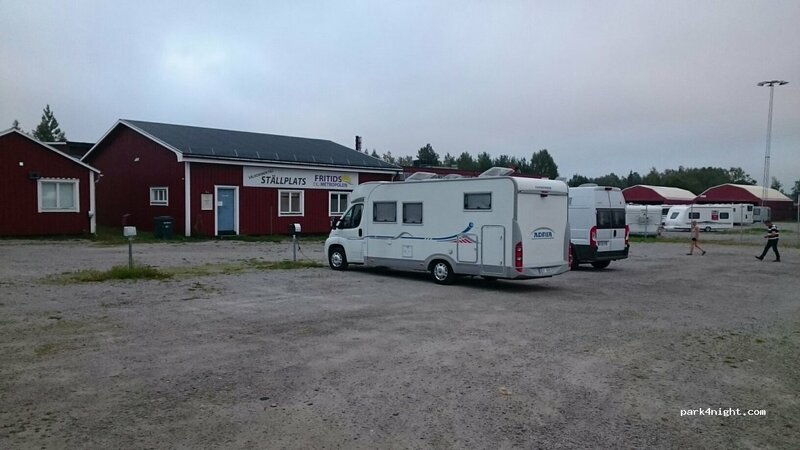 Un très bel endroit pour camper fournies par un vendeur de camping-car et caravane juste au sud de Umea. Douches et toilettes, WiFi très rapide. 165kr par nuit. Quiet, beautiful place about 1 mile south of Umeå. Good service house w wc, shower, dish, washer / dryer, drinking water. 165: - m el. No drainage gray or black water. Fun camping site and RV sales next door. Here you can supplement your equipment that you miss forgotten at home. Wir sind 22:30 Uhr angekommen und konnten sofort Strom entnehmen. Die Schlüssel steckten. Man muss den Stellplatz und das Kennzeichen via SMS versenden und bekommt einen Code für die Dusche zugeschickt. Diesen haben wir in der Nacht 3:50 Uhr erhalten, sodass wir früh gleich die sanitären Einrichtungen nutzen konnten. Diese sind sehr sauber, allerdings nur eine Dusche und nur ein WC vorhanden. Für uns kein Problem weil wir alleine waren. Habe ein Bild der Beschreibung hinzugefügt. A good overnight stop. By an RV dealer/shop. 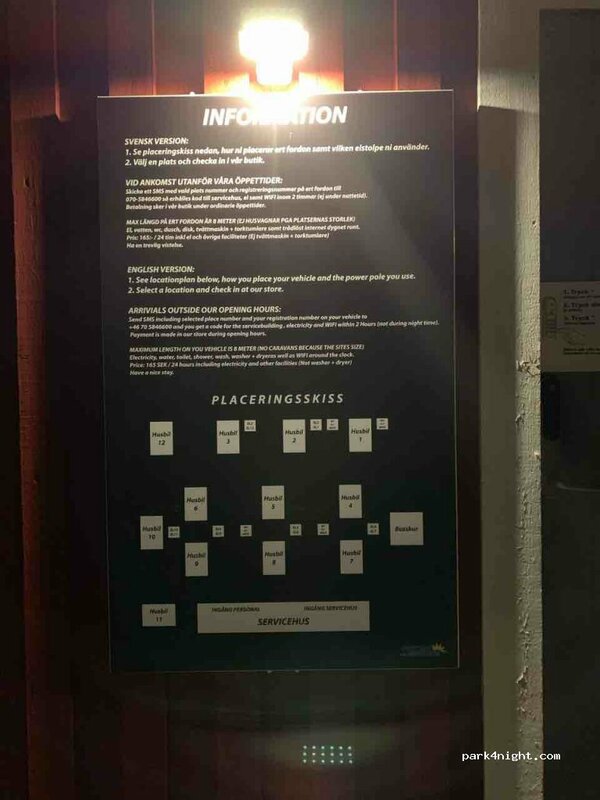 We arrived about 7.30 pm and followed the written instructions on the toilet block door to text our details. Reply with codes for the toilet block and to access hook-up was prompt. Toilet and shower block was warm clean and comfortable. Paid at the Shop in the morning. Arrivati in orario di chiusura dell'ufficio abbiamo inviato un sms al numero indicato per ottenere elettricità e codice di accesso ai servizi. Nessuna risposta nemmeno dopo le 2 ore indicate come tempo massimo di attesa. Pessimo biglietto da visita. Bruit de la route assez présent et absolument rien à faire sur place, mais la propreté des infrastructures (douche/wc et parties communes) compensent le tableau. Nice parking lot at an RV dealer. Shower and toilet available on site, really clean and quiet. Perfect for a one night break. No toilet emptying ! Not even casette. Grey waste has to be emptied using your own bucket. The toilet and shower are great though ! Sehr sehr ruhig war am 23.5.2017 noch alles geschlossen aussetzen Strome funktionierte. 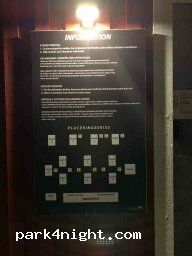 Très pratique en plan de secours : l'essentiel est la à un prix raisonnable. Bien pour une étape, grand centre commercial à moins de 10 km. Just for a night. No charm. locals use the place to walk their dog. Parking near a beautiful swimming with beach, toilets, barbecue. Very calm.